Are you new to town and want to discover the cuisine or just looking for a new place to hang out with friends and family? Our scenic town offers an eclectic food scene from street-side burgers to top-floor gourmet to ethnic food, with downtown farmers markets and food festivals adding further spice. Award-winning chefs use the freshest fare, paired creatively with local ingredients from the wild and from nearby organic farms. 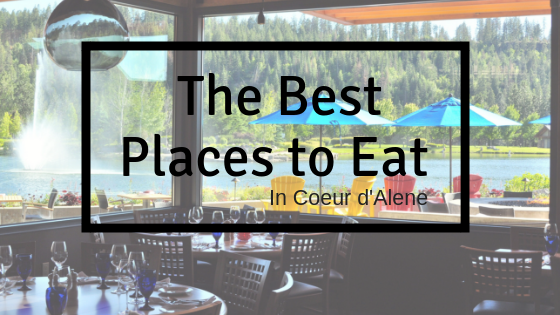 Here are the best spots to grab a meal in Coeur d’Alene. Travelers make the pilgrimage for what may just be America’s best basic burger. Harley Hudson opened his hamburger shack in 1907, and since then the “Huddy Burger” has been a local favorite. Harley’s grandsons still run the counter-only diner. While you wait for your burger, handmade from scratch, (double or single patty, cheese, pickle & onion are your choices), check out the black-and-white historic photos on the wall. And don’t make the rookie mistake of ordering fries—they don’t serve them. No website; located at 207 E. Sherman Ave.
Named after Idaho’s gemstone, The Garnet Café is owned by a couple with a small family farm, bringing a true farm food experience to their customers. They use their own farm-raised pork, beef, lamb and eggs, and recently added goat cheese from their dairy. No website; located at 315 East Walnut Ave.